At a glance, Shop Your Way looks better and easier to earn the reward than Stop & Shop. However, Stop & Shop offers extra points on the purchase of some items. See weekly circular and make sure that they have a type of price tag in store. (as pictured below) According to this week’s circular, you must buy any of 8 items to earn 500 points=50 cents per gallon. Aside from the reward, the price of them are good deals. If you regularly buy some of these items, stock up on them. 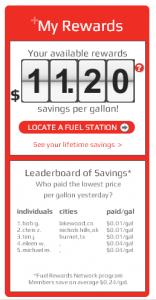 It allows to earn 10 offers per household (5000pts=$5/gal!) If you don’t find any items necessary, wait for next week. The bonus items change every week. 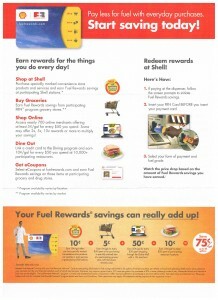 Kmart has a reward program called Shop Your Way Reward (A gas coupon is something additional. This is the main loyalty program of Sears, Kmart and Lands End). SYWR is a great program. When you combine with coupons, you can earn lots of reward points, and you can redeem for the next purchases. But deals are so timely. In my opinion, Kmart is not a good store to buy every day items, especially groceries. Besides, the 30¢ discount coupon can’t be combined with another 30¢ discount coupons. Only one coupon can be used each transaction. As for Stop & Shop reward points, you can redeem up to 2200 points (save $2.20 per gallon), up to 35 gallons per transaction. Please note that there is an expiration date on both rewards. For Shop Your Way GAS REWARDS, a coupon is valid for 30 days. The exact date is printed on the coupon. 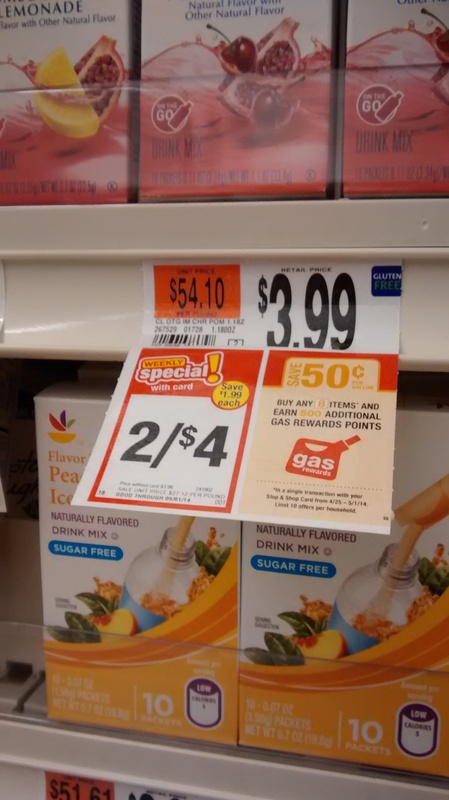 For Stop & Shop Gas Rewards, points you earn expires 30 days later. You can check the exact date in the website. 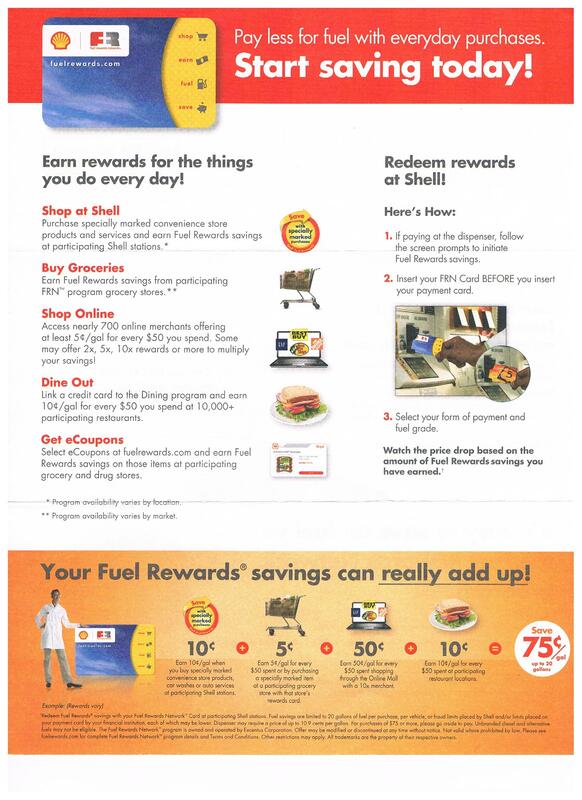 Considering bonus items, Stop & Shop Gas Rewards is much easier to earn more rewards. Saving $2.20/gal is very appealing. And the discount is applied up to 35 gallons. If you own 2 or more cars, fill it up at the same time to get discount as much as possible. It is not difficult to earn thousands of points every week and redeem a maximum reward every fill-up! Fuel Rewards Network (from the previous post) and Stop & Shop Gas Rewards are both for Shell gas stations. Let’s unveil the potential of Fuel Rewards Network and compare them in the next post, “Stop & Shop Gas Rewards vs Fuel Rewards Network“. 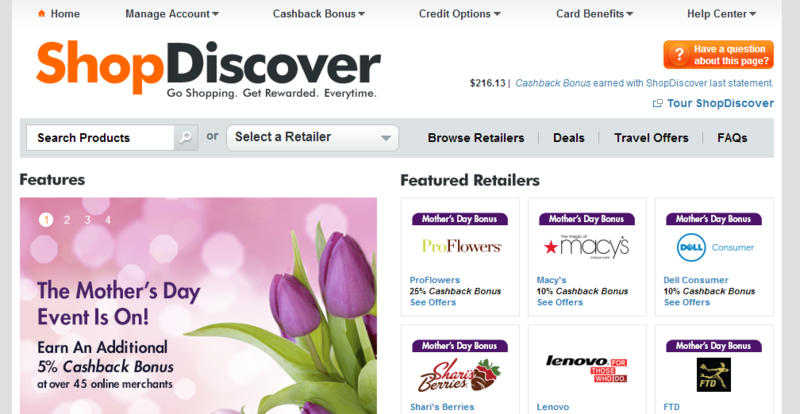 “Discover it” is a credit card which I earn cash back the most every month among all credit cards I have. I think that this is the best card for those who shop online a lot. 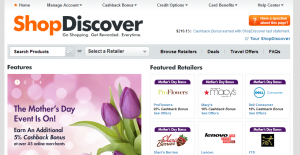 Discover’s online mall, ShopDiscover has over 200 retailers. This number is much fewer than other online portals such as Chase Ultimate Rewards and Citi Shopping Center, but ShopDiscover covers most of major retailers. I can find almost all retailers I usually shop in ShopDiscover. Although it has fewer retailers, some retailers can find ONLY in ShopDiscover, like Moosejaw.com, Harborfreight.com. 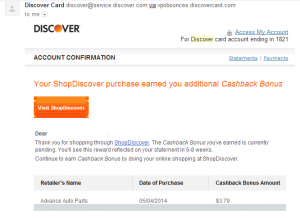 Shopping through ShopDiscover gives you at least 5% cash back. 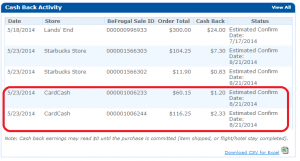 As compared ShopDiscover’s cash back bonus of my favorite retailers with other online portals, I found some of them are the same, but most of them are better. 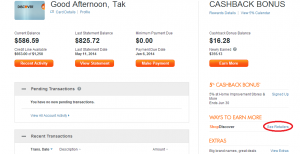 It is my first credit card which offers the reward (cash back). 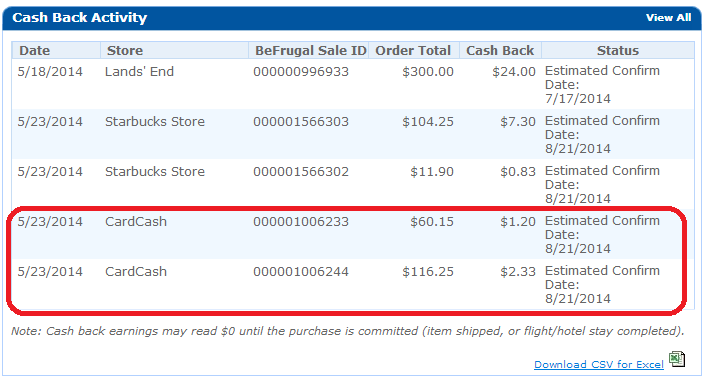 When I just received the card, I was so happy about 5% cash back on rotating category and 1% on everything else. And it is a shame that I didn’t know about online portals and hadn’t used it for first 4 months although I made many online purchases. I have missed so much cash back during that time. So, for those who don’t know about online portals, here is a walk-through of ShopDiscover. 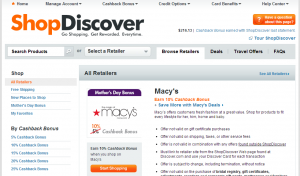 Please note that ShopDiscover became Discover Deals on January 8th, 2015. Click here to see details. The seasonal or occasional bonus offer. Not all but many retailers offer additional 5% cash back. 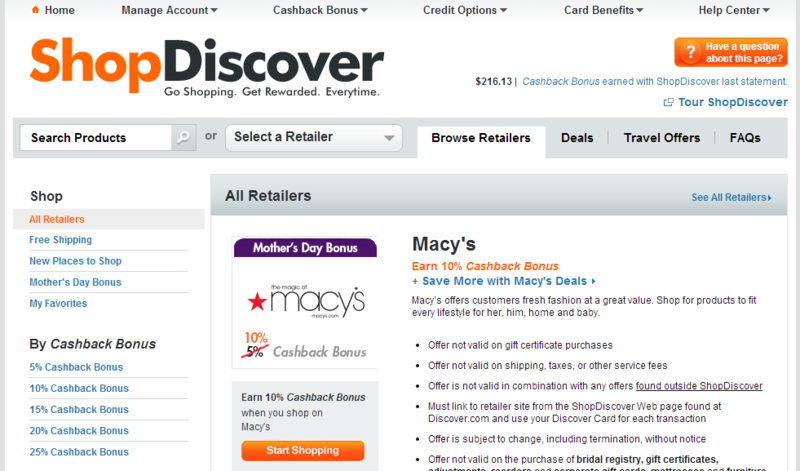 Here is an example, Macy’s.com’s page. You will see this type of bonus very often throughout a year! While 5% cash back on rotating category are capped $1500 on the purchase each quarter, cash back earned through ShopDiscover is NO LIMIT! The more you buy, the more you earn! There is another point I like “Discover it” card the best. That is its great redemption options. Here is a list of options. Basically, one reward dollar= one USD. However, when you redeem for partner gift cards, one reward dollar can be worth more than one USD or even doubles. 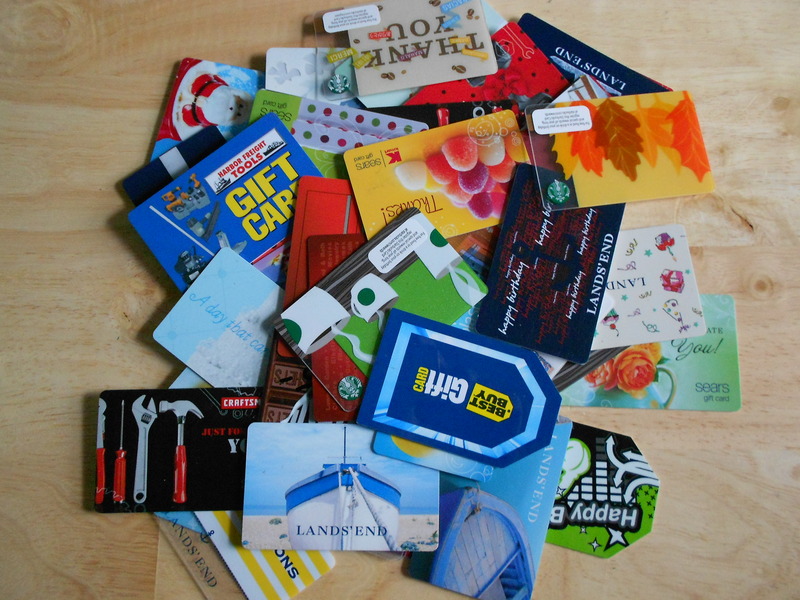 Partner gift cards (over 150 retailers’) are ALL on sale. You can get $50 Macy’s gift card for $45 reward dollar (10% discount), $25 Lands End gift card for $20 (20% discount), most gift cards in travel and vacation category are more than 50% off! Never choose “Pay with Cashback Bonus”. 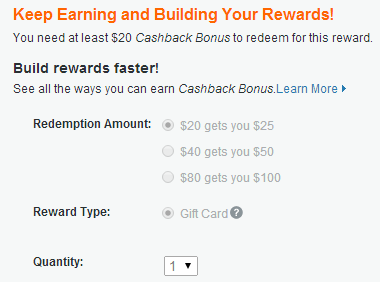 This feature, which is also found in Ultimate Reward, lets you redeem your reward dollar directly at amazon.com. If you do so, you can’t get any cash back through the transaction at amazon. 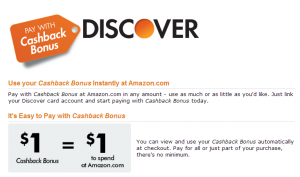 If you redeem for statement credit, or direct deposit and then make a purchase at amazon.com with Discover card, you will get 1% cash back. So, don’t use this feature unless you need it for some reasons. 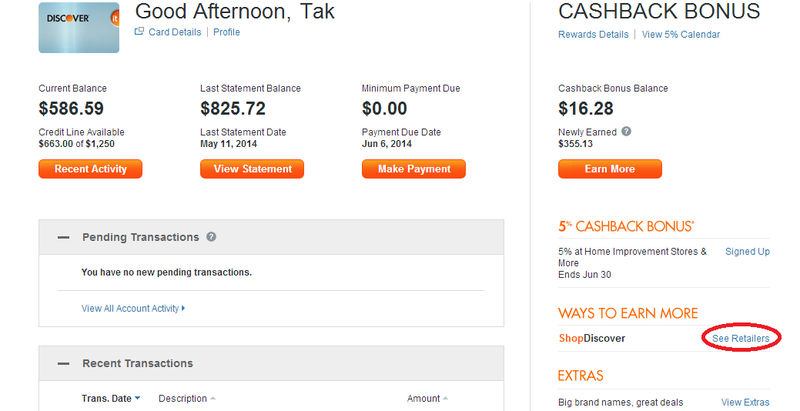 Like Chase Freedom and Citi Dividend, “Discover it” offer 5% cash back on rotating category. Discover’s Q4 is very unique and useful. 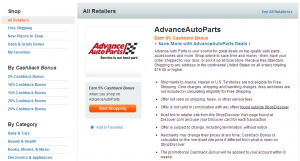 This offer is capped $1500 on purchases each quarter. If you want some ideas to get a full cash back ($300 a year) from Rotating Category. 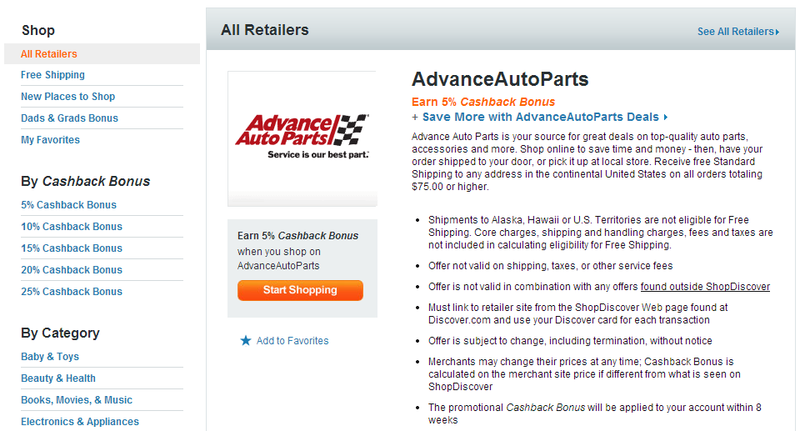 Overall, “Discover It” is the best cash back credit card for those who shop online. 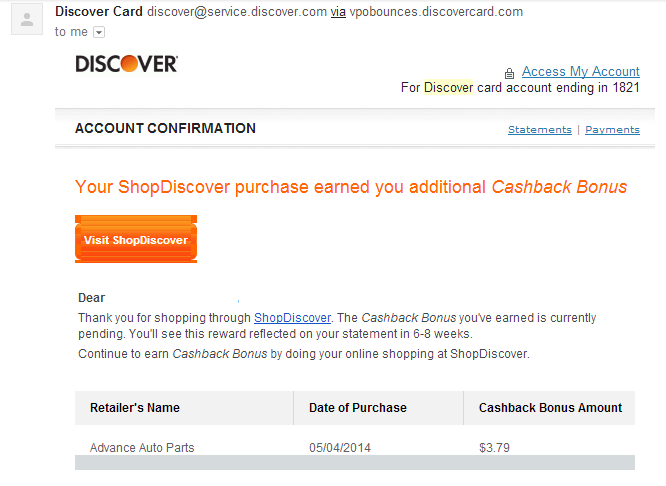 Any other online portals don’t offer as good rewards as ShopDiscover. And you can’t see so many gift cards with discount to redeem. 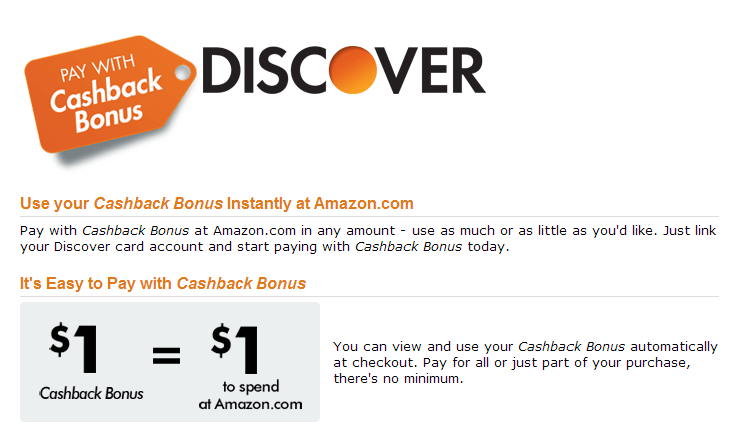 That is all about King of Cash Back “Discover it” and why I like it the best.